The scenery is outstanding with lush tropical greenery moving its way from the waters edge high into the mountainous hillsides all around you. This splendid gift of nature consists of floodable jungles, swamps, lakes, rivers, grassland and savannahs under palm trees. Your yacht charter for this spectacular trip up the Rio Dulce in Guatemala, will start in Placencia, Belize. From Belize you will clear out at customs in either Big Creek or Punta Gorda and then make your way to the river mouth at Livingston. The sail from Belize to the entrance of the river will take you approximately 8 hours but you can anchor half way, making the sail relaxing and stress free. Once you arrive at the mouth of the river you will need to clear in with customs and immigration. Call on VHF 16 and the officials will come to your boat. Raul, the Customs Officer is the only official that speaks English and he is always happy to help. Once they have taken all your details you will then need to go into Livingston and see Immigration, Customs and the Port Captain separately. When you take your Dinghy into shore you will instantly be approached by the locals, they are friendly and just want to look after your dinghy until you get back. You will definitely want to take one of them up on their offer, this way you will still have a dinghy and outboard on your return. Do not pay them until you get back and 10 Quetzals is the going rate. Livingston is noted for its unusual mix of Indian, Latino, Maya and mainly Garifuna people. The village is alive with the magic of Garifuna culture, brightly coloured buildings, small gift shops, restaurants and bars. The transformation zone between the fresh water river meeting the salty Bahia de Amatique makes marine life thrive. This marine life supports a huge concentration of birds that fly high over Livingston. Supported by a large fishing industry, you will see many fishing boats and shrimp boats around the Livingston bay. At night the shrimp boats have their nets covering the entire entrance so make sure you only arrive in day light. Livingston is hilly and tropical, with a totally different feeling to anywhere else in Guatemala. Once you start to motor up the river the hustle and bustle of Livingston will die away and you will be transfixed by the beauty around you. 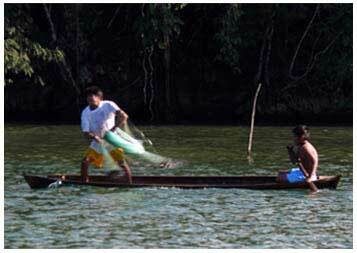 For the next four hours you will travel up the winding river to Lake Izabal situated at top. On either side of the river you will see lush green steep walled canyons of tropical rainforest that resemble those in the Amazon. With no gaps in the trees their tall stance raises some 400 feet towards the sky with exposed roots visible along the sides of the river. This splendid gift of nature consists of floodable jungles, swamps, lakes, rivers, grassland and savannahs under palm trees. As you quietly and slowly float through this emerald paradise you will see many spectacular birds. With over 600 bird species inhabiting the river banks and surrounding jungles you will be dazzled by the bird’s brilliant colours, size and graceful flight. You will be joined by sweet chirping, small brown and white birds that will swoop around your yacht and sit on your guard rails. Full of life the river has over 200 species of freshwater fish, manatees, otters and turtles also inhabit the waters. On the banks of the river you will find Iguanas lazily basking in the sun and howler monkeys swinging in the trees. The exotic wild flowers offer a bright contrast to their tropical green background and volcanically heated sulphur hot springs can be visited along the river. Sailing up the river and through the El Golfete you will find local families in their dug out canoes fishing for their dinner. Their homes are very basic and small clusters of Mayan and Indian settlements are scattered along the river banks. The El Golfete, about 6 miles up the river is an expanse of shallow water approximately 10 miles by 3 miles, with depths of between 6 to 12 feet. The lake has many cayes that are surrounded by reeds and hidden along the shores are quiet bays, rivers and lagoons. As you enter the El Golfete care is needed as large roots stand just above the surface. These roots are very big and can damage the yacht so bow watching is recommended at this stage of the journey. The scenery is outstanding with lush tropical greenery moving its way from the waters edge high into the mountainous hillsides all around you. On the northern shore of the El Golfete you will find the Manatee Reserve. The reserve was set up to protect these severely endangered, docile mammals and all visitors are welcome. The river then opens out and you will see many yachts anchored or moored in the Marinas at the side of the river. You will see “Back Packers” bar and restaurant on the left and “Bruno’s on the right before the bridge. Bruno’s has a dinghy dock and as long as you buy a drink, they are happy to keep an eye on your dinghy for you when you go into Fronteras. Under the bridge and to the far end of the river you will see Castillo de San Felipe, a small castle built by the Spanish around c1600 to protect the peninsula being attacked by pirates. In the early 16th Century trade was established between Guatemala and Spain, this lead to a dramatic increase in piracy in the Rio Dulce. A tower was built in 1595 with 12 artillery and 12 solders were placed to man the post and defend the cargo from pirates. By mid 1650’s piracy had decreased and the fort was used as prison and place of exile. In 1666 the De La Costa pirate brother attacked the fort and it went back to being a position of defense. From then until 1736 the fort was attacked, destroyed and re-built several times until finally it was left to ruin. In 1956 the original castle plans and documents were found in archives in Spain and full restorations were carried out. The excavation of the site found the original foundations, which the new building was erected on. The castle has towers, patios, dungeons and rooms that conserve the military architecture of the colonial period. The original Cannons were found in the river and restored back to their rightful place. The castle is open to the public and it is a fabulous place to take a picnic and relax in the sun in the castle grounds. You can anchor either side of the castle and take your dinghy into shore. 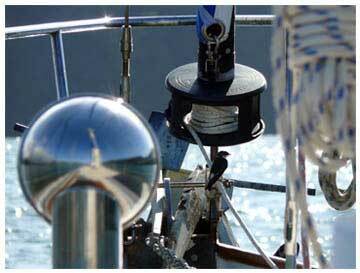 Make sure you anchor away from the channel as small boats speed around the corner. Lake Izabal is the largest lake in Guatemala and is over 589.6km squared, lies only 8m above sea level and in places is over 50 feet deep. The lake is filled by many fresh water tributary rivers the largest being the Polochic river that flows in northeastern Guatemala and enters the lake at the west end. The river is surrounded by tropical vegetation with the Santa Cruz Mountains to the Northwest and the Minas and San Isidor Mountainous range to the southwest and southeast. The views are breathtaking with family homes and hotels scattered along the waters edge. The water is fresh and abundant with fish and unique to the lake is fresh water manatees. 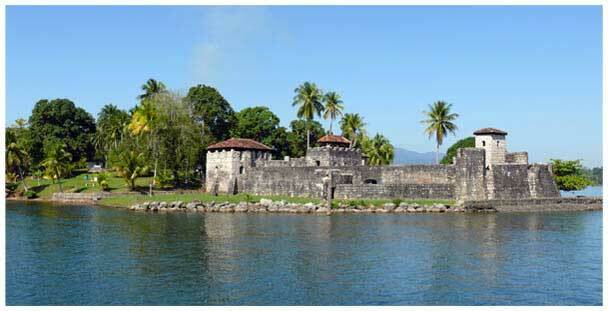 Banana Palms Hotel is located about 300 feet away from Castillo de San Felipe, on the same side of the lake. The hotel is very accommodating and offers Breakfast, Lunch and Diner in their pretty restaurant overlooking the lake. The service is excellent, very friendly waiters and the food is good. If they are not busy they will let you tie up to their dock or you can anchor just a little way off and dinghy into one of their dinghy bays. An evening here is great fun, they have a games room with pool tables, basic dart boards and a large TV playing sport and music. There is a bar in the games room and they are happy to serve you until you leave, regardless of the time. During the day they are more than happy to let you use the pool providing you have a meal with them. Fronteras and El Relleno are the two towns located on either side of the river at the base of the 85 foot steel and concrete modern bridge. They are rough and rugged towns that offer a cultural experience. These towns have numerous small shops, stalls, diners, an ice-cream shop and inexpensive hotels. There are banks where you can exchange your money and marine and hardware shops. The towns are very busy, full of life and a great place to see. Be sure to put all valuables in a safe place and out of sight. Casa Guatemala is an orphanage located on the river. They offer caring, health and education to over 250 children that have been abandoned, abused or have families too poor to provide even the basics for a child’s needs. Many charterers take a few hours out of their trip to go and visit the orphanage. The orphanage is independently run and items such as stationary, Spanish books, children’s clothing, socks, shoes and any contributions that you can make will be gratefully received. If you do not wish to see the orphanage, have a drink at “Backpackers Bar”. It is a local bar and restaurant set up by the orphanage and run by young volunteers from all over the world. The bar and restaurant profits are given straight to the orphanage. Every Little Helps! Belize and the Rio Dulce is a superb charter destination and you will not be disappointed. Offering spectacular scenery, wildlife, marine life, and culture, these two diverse countries will leave you wanting to return to see more. It will take you 4 to 5 days to complete the Rio Dulce experience, and most people prefer to incorporate a few days of relaxation in the cayes of Belize as well, for this reason a 10 day charter is recommended.